Images from the 1600s through the 1800s look remarkably similar. By 1774 “…the use of this sort of jack is common enough; but its construction and manner of acting being clearly understood by few..." Detailed descriptions form period works - 1680, 1774, 1806, 1844 - follow a brief photo series. A later post will deal with the pros, cons and excerpts from period writing. "Second Book. Chap. I The divers kind of Automata, or Self-movers. Of Mills, and the contrivance of several motions by rarified air. 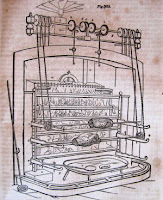 “But there is a better invention to this purpose mentioned in Cardan, whereby a spit may be turned (without the help of weights) by the motion of the air that ascends the chimney; and it may be useful for the roasting of many or great joynts: for as the fire must be increased according to the quantity of meat, so the force of the instrument will be augmented proportionably to the fire. In which contrivance there are these conveniences above the Jacks of ordinary use. It makes little or no noise in the motion. It needs no winding up, but will constantly move of itself, while there is any fire to rarifie the air. It is much cheaper than the other instruments that are commonly used to this purpose. 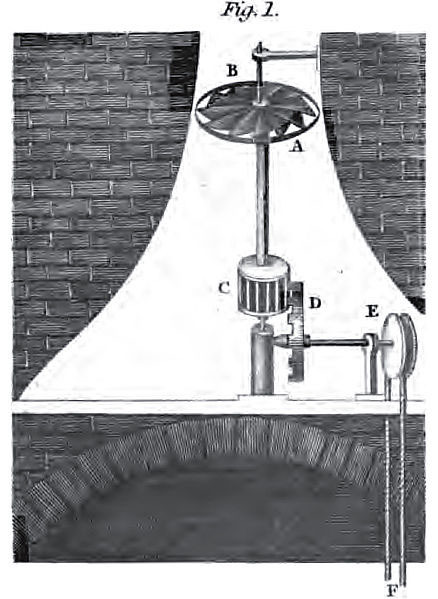 There being required unto it only a pair of sails, which must be placed in that part of the Chimney where it begins to be straightned, and one wheel, to the axis of which the spit line must be fastned, according to this following Diagram. These sails will always move both day and night, if there is but any fire under them, and sometimes though there be none. 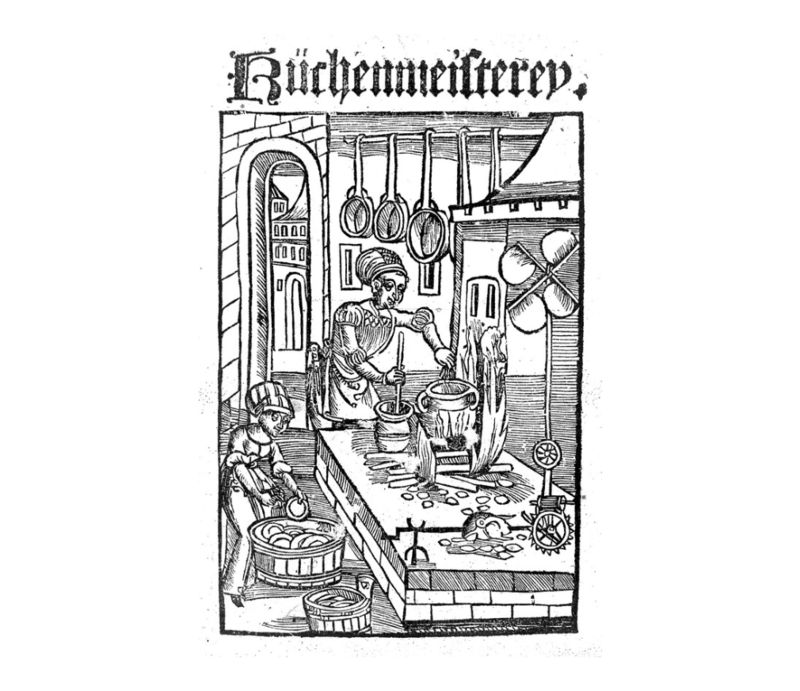 For if the air without be much colder than that within the room, then must this which is more war and rarified, naturally ascend through the chimney, to give place unto the more condensed and heavy, which does usually blow in at every chink or cranny, as experience shews." “…the use of this sort of jack is common enough; but its construction and manner of acting being clearly understood by few, we shall her describe them. 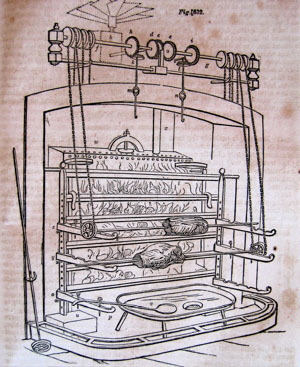 The horizontal wheel AB (Plate VII. Fig. 3) is placed in the narrowest part of the chimney that is next the fire: its wings, which are made of tin, are inclined to the horizon, that is, placed in a sloping direction. To the same axis on which A B turns, is likewise placed the cog-wheel C, that takes the teeth of the perpendicular wheel D. On the same axis with D, is placed the wooden wheel E, round which runs the rope F, on whose lower part is placed the wheel of the spit. 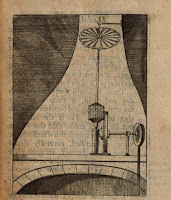 Now, the air, being rarefied by the fire, forces up the chimney, and meeting with the wings of the horizontal wheel in the narrowest part, necessarily turns it round, and at the same time turns the cog-wheel C, which turns D and E, together with the rope, which by its friction against the wheel of the spit, keeps that likewise constantly turning; and its velocity will be always in proportion to its weight, and the strength of the fire. 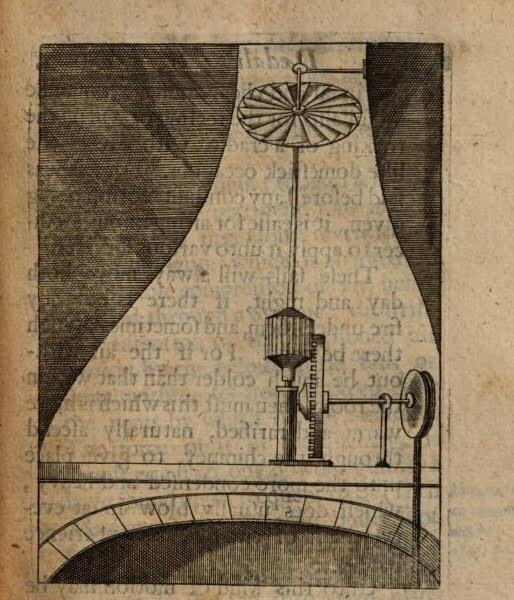 Therefore, if instead of the iron spit, the handle of the mill, be fixed in the center of the lower wooden wheel, it must, in like manner, turn that round; and the motion will continue not only while the fire lasts, but a considerable time after; for there will be a continual circulation of the air up the chimney, till that in the room becomes equally cold with the external air. 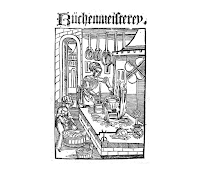 This machine may in like manner be applied to the reeling of yarn; to the making a hammer strike perpetually on an anvil; and many other domestic purposes.